Friday 12th February 1869 - Fine of £5 for assaulting police-constable Meale in the course of his duty. The worse for drink, Mr. Mayes had pulled the whiskers of the police constable as he was being taken into custody. A quantity of hair was produced in court having been recovered after, it was claimed, the assault. However Inspector Sharp swore that Meale had not presented the whiskers to him as evidence, whereas Sergeant Kirk swore that he had. Constables Middleton and Waites gave differing accounts of the language used in the arrest. The Bench agreed that constable Meales had acted with great forbearance and they strongly recommended him for promotion. Address as Little Cherry Street in 1867. On Tuesday 23rd August 1870 John Mayes applied to the magistrates for a full licence. It was peremptorily refused since at some time previous the applicant had brutally assaulted a policeman and it was a wonder he had not been killed. Full licence transferred from the RAILWAY STORES 01.04.1959. 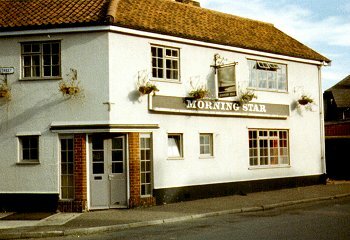 Described as one of Brent Walkers newly acquired pubs in September 1988 when the new licensee, Carolyn Williams had recently become licensee. Then 22 years old she was thought to be the youngest licensee in Norwich and one of the youngest in England. Acquired by Inn Care by March 1989, a company with 15 public houses. Became the CASK & KEG from December 21st 1994. Windows and doors of the inter-war period have drastically altered the appearance of this building which may be in origin one of the few remaining late 18th C / 19th C buildings left in this area. Two bars and hatch in vestibule for `off sales' department. Public bas has small inset bar counter with wood grained melamine top, matching tables, lino floor, leatherette benches. Lounge bar : Small inset bar counter, melamine top, padded leatherette front. Melamine tables, carpet, wood grained melamine dado. Bar counters interconnecting arranged around central triangular shaped core.